M’s loves to be my constant little kitchen helper. In my post “Cooking With Your Kid in the Kitchen” I talk about finding kid friendly tasks that make your child feel like they are contributing. Below are some great websites with kid-friendly recipes you can make with your little one. The kitchen is a wonderful place for young children to see how the food gets to their plate and even the dining table. Children of all ages can learn something new whenever they help. Young children can see what you are doing and help out with small tasks, such as setting the table or stirring something. Even the very little kids can join in by helping you prepare dishes or even just by giving them a few pots and utensils, they can pretend that they are cooking with you. There are also advantages to this time together, besides the kids having fun. Preschoolers see the behind-the-scenes work on how their dishes they eat are put together, while getting the hands-on experience. It helps them learn and feel like they are helping out! School-age kids can use what they learn in school, such as math skills, as they help put together recipes. This is also a great time to talk about nutrition and why it is important to eat healthy as well as explaining the purpose of the ingredients you are using to make the recipe. Essentially, putting down a foundation for healthy eating! Kids are not the only ones getting the benefits, parents get some quality time to spend with there children. Also, nothing beats seeing the smile on your kid’s face when they eat something that they made or help make. They are less likely to fuss about the food when they know they made it themselves! Here are some websites that have healthy and delicious recipes that you can do with your children! This website has really neat and simple ideas that help engage your children in making something delicious! It has recipes for homemade hot chocolate, mini turkey burgers, fish tacos, and lasagna, to name a few. Produce For Kids Ideal Meals™ are like having a personal nutritionist plan your healthy meals every day. Best of all, they are quick and easy to prepare. This website is full of kid-friendly balances meals & recipes that the entire family can enjoy. This website also has great tips on healthy eating for your entire family. This website has great recipes from kid-friendly breakfast ideas to after-school snack ideas. It also suggests recipes for picky eaters! This website has recipes that can make food more fun. Some of the recipes are cinnamon rolls (made with whole wheat flour), blueberry pancakes, fudge brownies, and Asian noodle salad. It even has recipes for smoothies and sorbets! This website gives tips and techniques to get your kids involved in cooking in the kitchen. It also gives menu ideas and five-ingredient easy recipes that can be done with kids. The website title says it all! This website has great snack, lunch and dinner ideas that can be made into characters’ faces that kids recognize making them fun to eat. 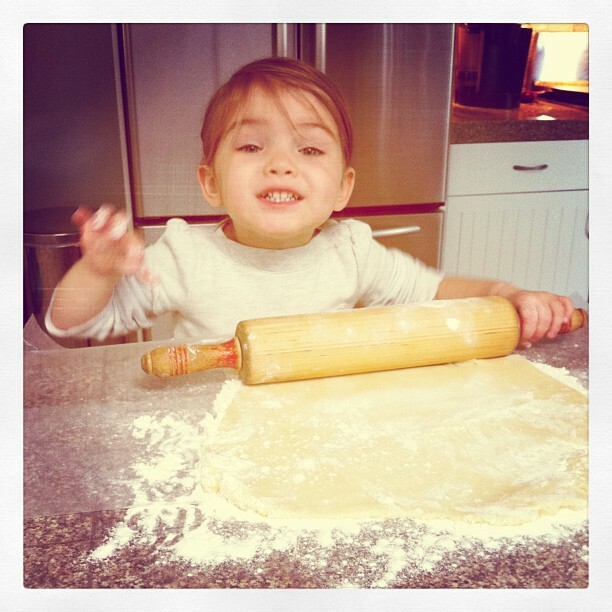 She will be a wonderful cook just like her Mom ! !